Female hockey players, executives and even the NHL are pushing for a merger of the National Women's Hockey League and Canadian Women's Hockey League professional circuits. And if that happens, a Seattle pro women's team should be added to play at Northgate Mall's incoming NHL practice facility. A news item last week about women’s hockey took me back to my student newspaper days at Concordia University in Montreal where I covered some of the best female players on the planet. Concordia’s teams in those late 1980s and early 1990s were a hotbed of talent — run by future Canadian national coach Les Lawton and featuring eventual Olympic gold medalist Therese Brisson, world championships winner Laura Leslie and American import and now Hockey Hall of Famer Cammi Granato, among others. Speaking with female players then, their goal was to play in a Winter Olympics, which Brisson and Granato did beginning in 1998 at Nagano when women’s hockey was added. Beyond that, they’d yearned for a professional women’s league mirroring the NHL. Three decades later, that dream has started taking shape with not just one, but two women’s pro circuits: the National Women’s Hockey League (NWHL) and Canadian Women’s Hockey League (CWHL). But where some see two leagues as a showcase of female hockey depth, others proclaim it a fractured landscape that must merge together if ever to go the NHL route. NWHL commissioner Dani Rylan told The Associated Press as much last week, writing in an email that: “One league is inevitable’’ after merger talks reportedly began last summer. And from my view, our soon-to-be-NHL city can play a key role in developing women’s pro hockey beyond its divided, East Coast-centric state. The coming $70 million NHL practice facility at Northgate Mall with seating for 1,000 would make an ideal home for a Seattle women’s pro team provided both leagues do merge into one. Having one league is critical for future NHL support. Some NHL teams already own or sponsor squads in the CWHL, now in its 12th season, and the newer NWHL, which formed in 2015. But the NHL itself remains lukewarm to how the women’s pro game is run, with commissioner Gary Bettman saying a single circuit is preferable. Kelly Goscinski, president of the Western Washington Female Hockey Association, the state’s only all-girls program for ages 4 to 19, calls it “a no-brainer’’ that a Seattle women’s pro team will happen. Goscinski’s association, founded in 2002, partners with the NWHL’s Metropolitan Riveters in which members of the Newark, N.J., team visit to give talks and on-ice tips to younger players. Having the NHL pour more money and marketing into the women’s pro game could revolutionize it. The CWHL went a decade paying bonuses and incentives, but no salaries. It finally caved on that last year, but only because the NWHL offered salaries right from its 2015 launch and caused defections of players to Rylan’s newer circuit. Still, with women’s pro teams averaging fewer than 1,000 fans a game and no season-long national television deal, there isn’t much money out there yet. After initially offering minimum yearly salaries of $10,000, the NWHL scaled back to around $5,000 to $7,000, just as the CWHL began offering “stipends” of $2,000 to $10,000 annually. The result is an old-fashioned stalemate. The NHL has its own “dog eat dog’’ history with rival men’s leagues. Whether player-raiding Western-based pro circuits into extinction a century ago, or fending off a World Hockey Association challenge in the 1970s, the NHL has historically emerged the lone survivor when multiple North American leagues compete. So, knowing history repeats itself, the NHL is seemingly waiting to see which women’s league wins out so it will know where to offer future support. Thusly, many NWHL and CWHL players would rather skip that whole Darwinian evolution bit and fast-track a unified circuit. U.S. Olympic gold medal winning hockey twins Jocelyne Lamoureux-Davidson and Monique Lamoureux-Morando echoed that one-league sentiment to Seattle Times reporter Scott Hanson during a recent local promotional stopover. Besides New Jersey, the NWHL has teams in Boston, Buffalo, Connecticut, and Saint Paul, Minn., while there are CWHL franchises in Toronto, Markham, Ont., Montreal, Calgary, Worcester, Mass. and — no, this isn’t a typo — Shenzhen, China, as the government there funds a team to grow its hockey prowess ahead of the 2022 Winter Olympics in Beijing. But there’s an obvious West Coast void. A merged league with franchises in Seattle and, say, Vancouver, B.C., would be cross-continental and opens the possibility of a Western conference so Chinese and Calgary squads can reduce some travel. The coming NHL rivalry between Seattle and Vancouver is already touted as a boon for those franchises. Both can replicate some of that on the women’s side by bankrolling teams. The current $270,000 NWHL team salary cap is less than half the minimum wage a single NHL player makes; a budget line item in Bettman’s league. 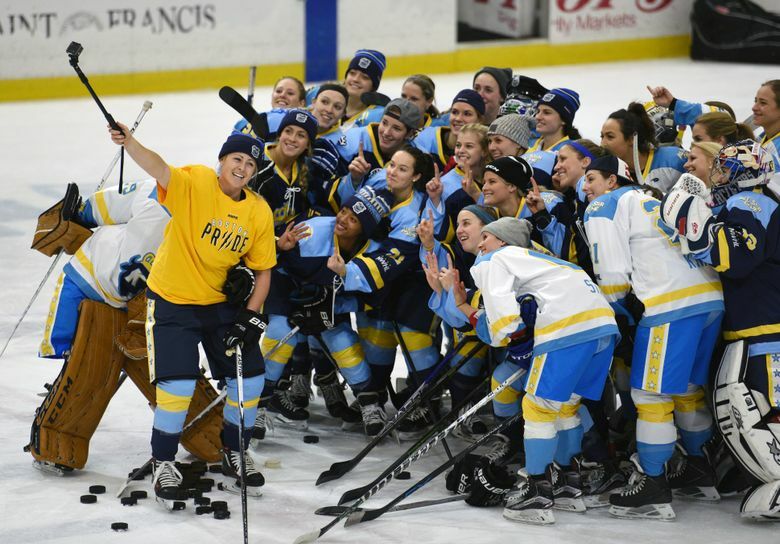 The Buffalo Beauts of the NWHL were bought in 2017 by owners of the NHL’s Buffalo Sabres, while the Riveters have a strategic partnership with the New Jersey Devils, as does the Saint Paul franchise with the Minnesota Wild. CWHL teams in Toronto, Montreal and Calgary have similar partnerships with the NHL Maple Leafs, Canadiens and Flames, respectively. So, there’s no reason Seattle’s NHL team can’t own or sponsor a women’s squad as another marquee Northgate attraction. It would finish a job started 97 years ago, when Seattle Metropolitans founders Frank and Lester Patrick created the Seattle Vamps women’s team in an ahead-of-its-time, ill-fated attempt at an all-female league to help grow West Coast hockey. Fast-forward a century, NHL Seattle CEO Tod Leiweke and Mayor Jenny Durkan both now say they also hope to grow Northwest grass roots hockey — especially for females. So, why not revive the Patrick brothers’ vision? But first, the NWHL and CWHL must get this seemingly inevitable merger done. That way, it won’t take 30 more years for my former classmates’ dreams of a women’s version of the NHL to truly take hold.